A long line of embroidered red curls, Laughter first reminds the viewer of a typical arabesque pattern. 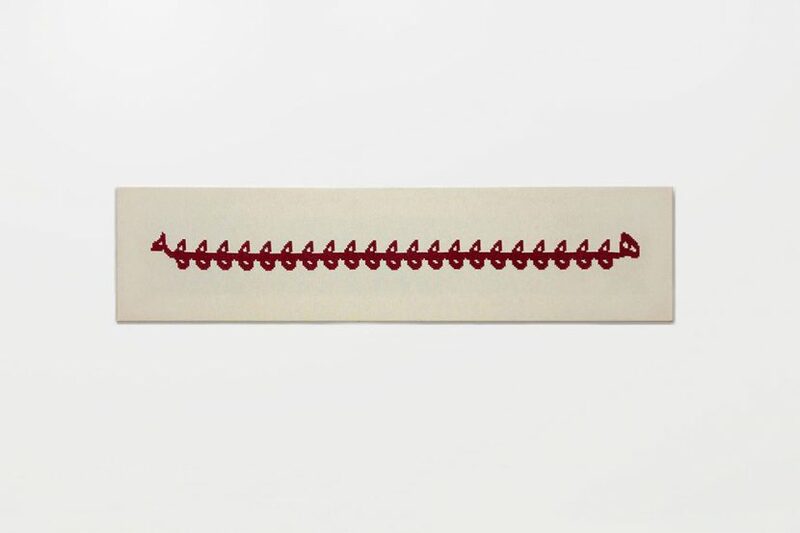 Although it uses a traditional style of Palestinian embroidery, in reality it seizes an Internet trend borrowed from the young generation: the transcription of laughter by « hahahahahaha » which in the Arabic alphabet yields a long ornamental line. 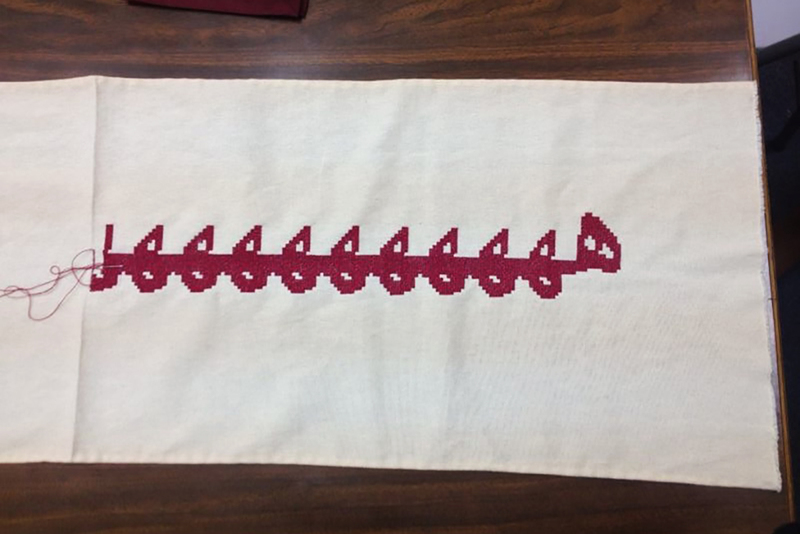 The word and its meaning are revealed by the contrast between the thread’s blood-red color and the white fabric on which the letters have been hand-embroidered. Laughter, the expression of an ephemeral and furtive emotion, is delicately frozen on the canvas, thereby acquiring a permanent form. As it becomes a singular pattern, product of social media, its existence is established, as are its deficiencies. Out of context, this expression appears absurd and static. While it gained a form and an aesthetic, it lost its musicality. The pattern also seems as soft as it is sharp. While the line can be seen as a simple decorative ornament, it resembles a serrated blade that cuts through the fabric with the geometric cross-stitching. Playing with the tension between shape and meaning of words, the installation confronts places and temporalities. 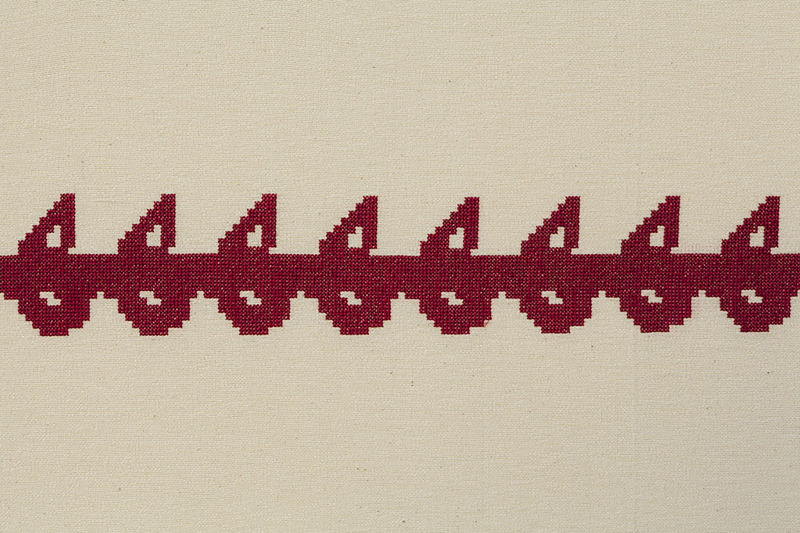 An ancient and local technique is used to depict a recent and transnational expression, while the spontaneity of the interjection contradicts the long process of embroidery.